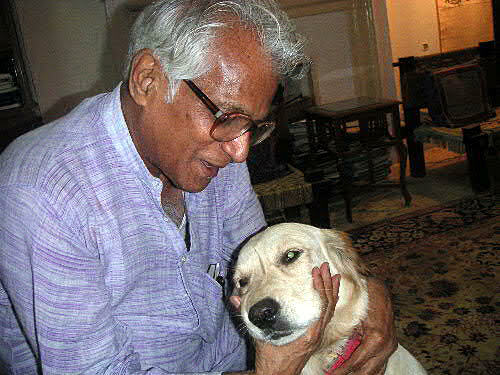 George Fernandes who died on January 29 in New Delhi at 88 following a long illness, was a combative and colorful figure in Indian politics till he faded away in the mid-2000s and subsequently fell ill. He was known to take a strong stand on major issues, including India-China relations. But despite alienation from China for a number of years because of the Tibet issue and the 1962 border war, he passionately worked for the improvement of ties with China as a Minister in the Atal Bihari Vajpayee government and thereafter also, as a Member of Parliament. His only condition for improving ties with China was that the relationship should be transparent and based on absolute trust. George, as he was better known, made this clear in his 2005 interview with Ms. Tang Lu, a Chinese research scholar attached to the Political Science department of Sardar Patel University at Anand in Gujarat. The interview, taken at a time when some influential forces were trying to oust him from the government, was published in Can Kao Xiao Xi (Reference News Daily), which is the largest circulated daily in China. It was a move to oust him from the Atal Bihari Vajpayee government which drove Tang Lu to seek an appointment with George. He had allegedly remarked in a TV interview that China is India’s Number One enemy. The Indian media had gone to town with it. But when Tang Lu met George in his home in New Delhi, he emphatically maintained that he never ever said that China was the main threat. He insisted that what was attributed to him was a spin by the media and interested parties. George said that he did not like everything that the two countries did in the past. “But we should not always dwell in the past,” he added. Tang Lu (TL): On April 23, I attended a seminar in Delhi. I noticed that in your keynote speech, you attacked all neighboring countries except China. You said a lot of good things about China. Will China be looked at as positively as you did? George Fernandes (GF): I look at the India-China issue in an objective manner. The 1962 war prompted me to recognize Buddhism and the Dalai Lama. The events of 1962 kept me away from China. But in May 1999, the US bombing of the Chinese Embassy in Yugoslavia brought me closer to China. I immediately called on the Chinese Ambassador in New Delhi and organized a conference to condemn the United States. For the conference I invited eight countries including China. The Chinese Embassy staff in New Delhi were very good and I was deeply impressed. TL: Mr. Fernandes, I am still confused. Once you did say that China is India’s number one threat, and now your utterances on China are so different. What factors prompted you to change your attitude toward China? GF: In fact, my attitude towards China has not changed. I have never said that China is the number one threat. It is just that some people have published articles in Indian newspapers saying that I said it. TL: What is the inside story? The interviewer then said: “Okay. Then do you agree that China is the number one threat? ” I said, “I will not say that China is the number one threat. However, I would say that China is a ‘potential’ number one threat.” I thought at that time that no one would dispute this view, because China might also regard India as the number one ‘potential threat’. In fact, if he did not ask this question, I would not have used the word ‘number one’. You know, Indian TV stations usually publish interviews which they think may be sensational. I remember it was the twelfth day after my interview when it was published in newspapers. At the time, I was on vacation in Nicobar and the Andaman Islands. That day, I got a call from Vajpayee (the then Indian Prime Minister). Vajpayee said, “George, what do you say about China?” I said, “I did not say anything”. “No, you said something about China, and now those words have appeared in Indian newspapers. You said that China is India’s number one enemy.” I promptly denied it. But Vajpayee countered saying that everybody in Delhi is talking about this. So, I quickly flew back to New Delhi. I asked my reporter friend to make the contents of the video public. He obliged. However, no Indian media published the full contents on the videotape! Later, I told the truth to all, but no one listened. 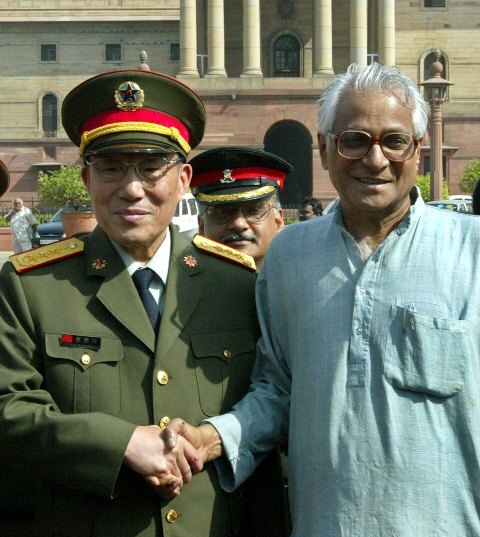 Defense Minister George Fernandes with his Chinese counterpart Gen Cao Gangchuan. TU: Why did the Indian newspapers not correct the statement? GF: That was definitely a conspiracy. Their intention was to drive me out of the government. They also wanted to maliciously create a big shock wave to disturb India-China relations. If I say such things I can’t stay in the government. At first, the Chinese did not believe that I uttered these words, but later they too believed the propaganda and sent protest letters to the Indian Prime Minister and the Indian side at different levels. Misunderstandings deepened between China and India. TL: These misunderstandings did not come to an end until you visited China in 2003. (George went as Defense Minister in April 2003 and was accorded a red-carpet welcome even in the midst of the upheaval over the Severe Acute Respiratory Syndrome (SAS) epidemic then sweeping China). GF: Many people were trying to stay away from Beijing, but I led a senior military delegation to visit China. I am not afraid at all. I feel that fear and worry are actually in one’s mind. For example, if you think you may have a fever, then you will have a fever. TL: You may know that most Chinese had a bad impression about you a few years ago. Do you have any concerns when deciding to accept an invitation to visit China? GF: When the Chinese Ambassador to India came to my official residence to give an invitation to visit, he said that China’s top leaders have invited you to visit China. I told him that he would know that I provided asylum to the Dalai Lama in 1959, and that he also knew my views on Tibet and the Dalai Lama, and I didn’t have a good impression of the Chinese. I know that the Chinese authorities had written two letters to the Indian Prime Minister. The second letter said, “For Fernandez’s fault, even after 100 years, we can’t forgive or forget.” With such a complicated background, how could I visit China? But the Chinese ambassador told me that everything in the past had passed. TL: Your visit to China in 2003 coincided with the end of the US military operations against Iraq. It is said that you planned to make a proposal that India, China, France and Russia should build an “anti-American corridor”. Did this suggestion almost cut off your visit to China? GF: Indeed. The Indian Foreign Ministry did not want me to make this suggestion when I visit China. On the eve of my visit to China, the then Indian ambassador to China, Mr. Shiv Shankar Menon, came to my house in New Delhi. I told him that I was always wanted to visit China. I said I had an invitation from the Chinese side, but the Indian Foreign Ministry seemed to have other considerations. Menon then went directly to the Indian Prime Minister’s residence. He asked Vajpayee why the Indian Defense Minister’s visit to China was being opposed by the Indian Foreign Ministry. TL: Fortunately, you did visit China as scheduled. What were you thinking about when the plane landed in Beijing? GF: After the cabin was opened, I was really overwhelmed. I had a feeling that I missed China. 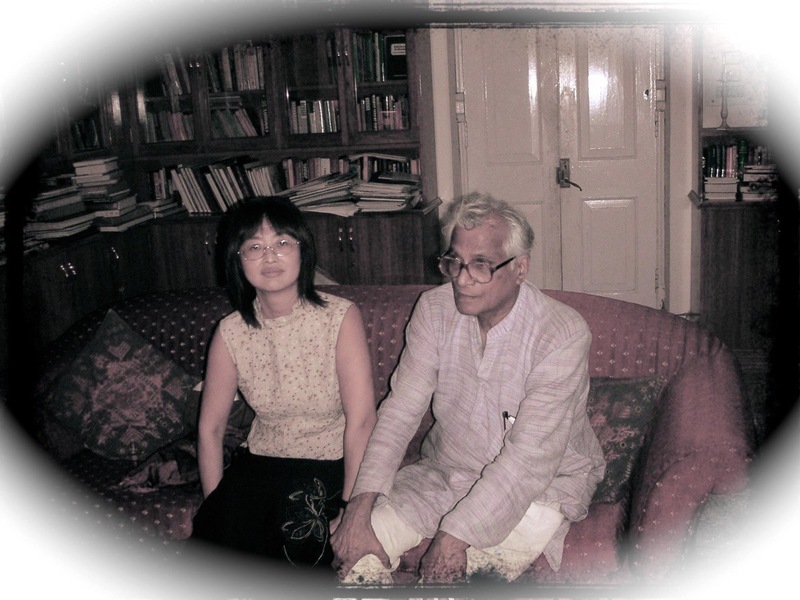 At that time, Mr. Menon, who came to meet me, told me that China had already laid a red carpet for me! TL: Your visit to China was a sensation. Wasn’t it? GF: Yes, the welcome in China far surpassed my expectations. The Chinese side told me that I could go to any place I wanted to see, meet any friends I wanted to meet, and do whatever I wanted. The most memorable meeting was with Premier Wen Jiabao. Wen said India and China are countries with the richest cultural traditions in the world. The two countries have been friends for more than 2,000 years, and only 0.01% of it encountered difficulties. We have more than 2,000 years of friendship, so we should forget the misunderstanding of the 0.01% period. In fact, when I met President Jiang Zemin and Defense Minister Cao Gangchuan, they also mentioned this figure 0.01%! The Chinese side clearly stated to me that China is not willing to confront any neighboring country. We only want friendship and do not want any misunderstanding, the Chinese said. TL: During the recent visit of Premier Wen Jiabao to India, the two countries formally proposed to establish a strategic partnership. What do you think of China-India strategic dialogue and strategic partnership? GF:”Strategy” can mean a lot of things. When it comes to strategic partnerships, the real meaning is that China and India are open to each other, and I am afraid there is nothing that can go beyond this. We are not talking about war now, nor are we talking about identifying the common enemy. Therefore, the term “strategy” can only mean one thing from the current specific situation, that is, China and India must cooperate. When it comes to issues in any field, as long as there is a possibility of cooperation, we must cooperate. TL: You are now the convener of the National Democratic Alliance (NDA). If one day re-governs, do you predict that the NDA will still see ups and downs in China policy? Will there be a breakthrough in your China policy? GF: During the NDA government led by Vajpayee, we successfully established friendly relations with China. Many people still believe that it was my visit to China that made China and India open and honest, followed by Indian Prime Minister Vajpayee’s visit to China. These two visits brought about tremendous changes in China-India relations. The current ruling United Progressive Alliance Government (UPFA) has followed the policy we originally established. I believe that if the NDA captures power again, China and India will certainly improve bilateral relations, and will never destroy each other. You can look at our current economic relationship. When I visited China, the trade volume between China and India was only in double digits, and now it has reached US$ 13.5 billion. The leaders of our two countries have confirmed that China and India must be friends. Now that India is a democracy and China will one day become a democracy, I have no doubt about the two countries being friends. TL: China-India strategic cooperation has caused concern in the West led by the United States. It is obvious that the United States is unwilling to see China’s rise. The United States hopes that India will become a powerful force to help contain China. Do you think India will play such a role? GF: I don’t believe that the wishes of the United States can be realized. China and India must cooperate, China and India must believe in maintaining peace in this region. Therefore, both sides must fully trust each other. If there is no trust, there will be no strategic partnership. If China and India continue to doubt each other and lack trust, then a war like the one in 1962 will still happen. TL: Many of my Indian friends have said that China and India should join forces. If we join hands, the whole of Asia will belong to us. If China and India split or confront, the United States may rule Asia. Your comment on this sentence? GF: It is important that we see China and India go hand in hand, and we must maintain a transparent relationship. Transparency means that the two countries fully trust each other. We must cooperate in all areas that may pose a threat to the two countries, such as in military, cultural, political, and economic areas. We cannot conceal anything from each other in our hearts. TL: You visited Taiwan in November last year. Although your visit was private, because of your influence in Indian politics, it also reflects the attitude of some Indian officials against the One China policy. Is India trying to narrow the distance from Taiwan? GF:I know that the Chinese government was very sensitive to my visit to Taiwan. The mainland is a friend of India and Taiwan is also a friend of India. What kind of relationship is maintained between China and Taiwan is your business. India’s friendship with Taiwan does not mean that India wants to downgrade the relationship with China. TL: During the visit to Taiwan, you also talked about the establishment of a strategic alliance between Taiwan and India. GF: But that is not a military alliance, but only economic cooperation. China currently has a large amount of investment from Taiwan, and we also hope that Taiwan will invest in India. I am talking about friendly relations between China and India. I can’t talk about friendship and hold a butcher’s knife on the other side. This kind of thing is absolutely unacceptable.